Today we’ve got updated aerial imagery of Disneyland’s version of Star Wars: Galaxy’s Edge from our friends at Nearmap. 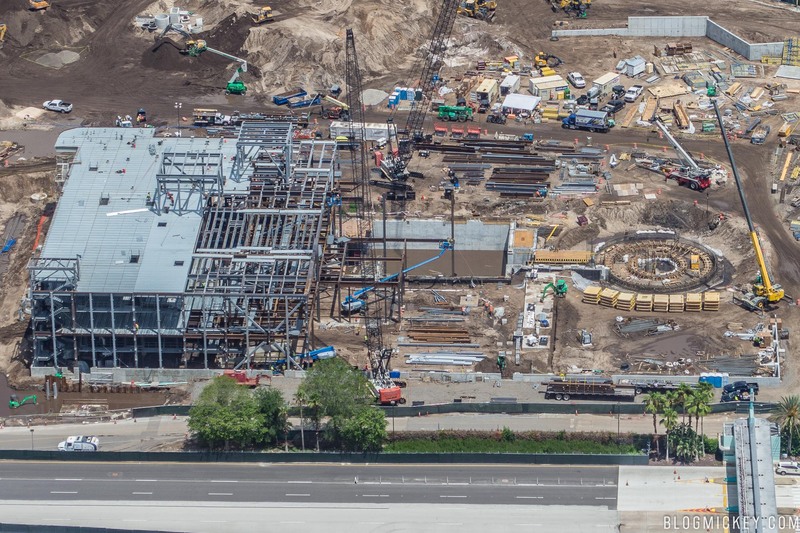 Normally we don’t cover Disneyland construction news, but with an identical build going into Disney’s Hollywood Studios, we’re very interested in the progress out West. Note that these aerial images are from July 17, 2017. Let’s dive in. First, an overview of the land. We can see the First Order Battle Escape attraction building on the left of the image, and the Millennium Falcon ride in the center-top of the image. Here’s a similar view of Disney’s Hollywood Studios from 3 days later. The most noticeable difference is the progress on the Millennium Falcon attraction building. At this point in construction, the DHS version hadn’t even gone vertical. Let’s take a closer look at the Battle Escape attraction. The building appears to be in three sections, as viewed from the top. The left section looks to be the newest, center section appears to have an exposed steel roof, and the right-most section looks to be the most matured section of the building. Let’s compare to our aerial flight. This would be a reverse view of the imagery above. Notice the circular pit partially covered on the left in the above image, and the exposed circular pit on the right side of the below image. Now the Hollywood Studios version from three days later. While the Disneyland version had half of the show building fully enclosed, the Hollywood Studios version only had the beginnings of what are expected to be the circular ride components. For a better idea of how far ahead Disneyland is, here’s the July overview of their version of Star Wars: Galaxy’s Edge compared with our August 20th flight. The second image is Disney’s Hollywood Studios and a reverse look at the land compared to the Disneyland imagery. 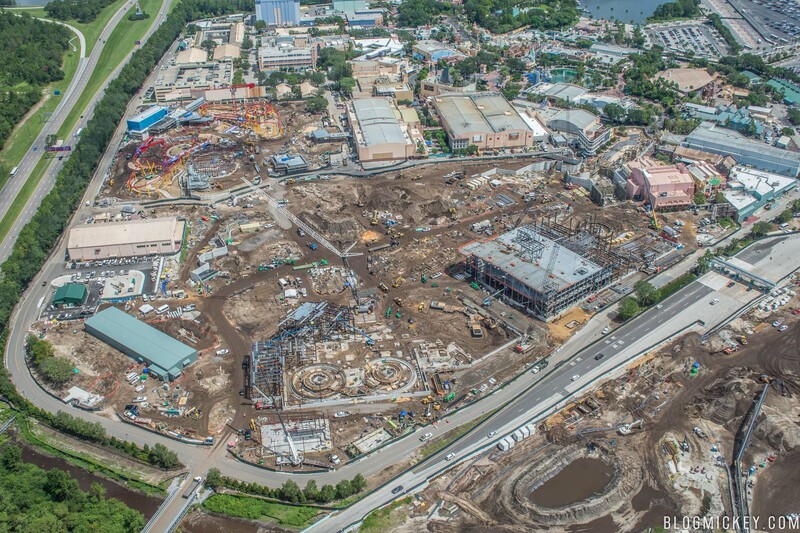 While it is clear that Disneyland construction is ahead of Disney’s Hollywood Studios, the question remains: how far ahead? We’ll be flying again in the coming weeks and should be able to answer that question a bit better, but judging by what we were able to see on the ground most recently, I’d say Hollywood Studios is roughly 2 months behind. Disneyland did need to do more infrastructure work along their Rivers of America section boundary as evidenced below, but the gap seems to consistently be around 2 months. We want to thank Nearmap, the leader in high-resolution aerial maps, for sending the images our way. 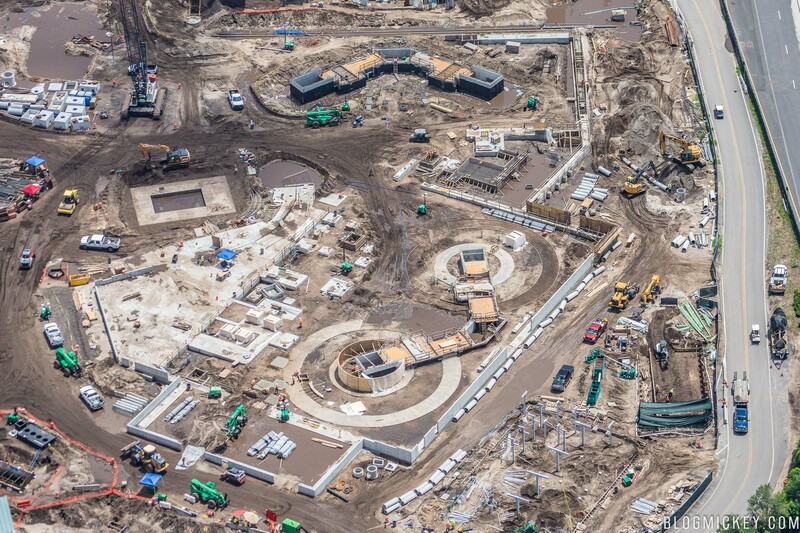 We’ll continue to cover the progress of Star Wars: Galaxy’s Edge from the ground and air over the coming years, so be sure to keep it locked on BlogMickey.com! Previous article“MK-1 Enabling Package” Permit Filed for Main Street USA Theater, Coming 2019? Thanks for the details. The 2 month time difference is a great estimate I think. What I am also curious about is if there is a size difference? It really seems to me that Disneyland’s version will be bigger. I’m wondering if you have Nearmap imagery from Hollywood studios to do a layover and compare the 2?